MIDLOTHIAN, Texas — A public school district in Texas has covered two dedication plaques that referenced God with duct tape after a prominent atheist activist organization asserted that the displays did not belong on school property. The Midlothian Independent School District has confirmed that a plaque has been covered at Mountain Peak Elementary School and Longbranch Elementary School due to the complaint. Last year, an anonymous resident contacted the Madison,Wisconsin-based Freedom From Religion Foundation (FFRF) about the plaques, which in turn sent a letter to the district to demand that they be removed. 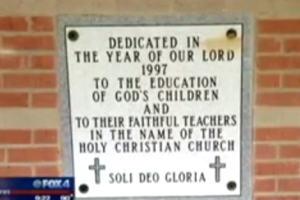 “It should go without saying that a public elementary school may not proclaim ‘glory to God alone’ nor dedicate itself to a particular church,” FFRF said in a statement to local television station KFOR. Stewart said that the plaques have now been covered and will eventually be replaced. FFRF said that it is pleased that the district has cooperated with its demands. “We do applaud the school district for taking swift action to correct this Constitutional violation,” the organization said. But others state that Stewart should not have folded so easily. Parents held a prayer gathering on Wednesday at the school flag poles, and a protest is scheduled for today at the district administration building. The Facebook group “Bring Back the Plaques” also has over 4,800 members. The Plano-based Liberty Institute, a Christian legal organization in the state, says that it is contemplating involvement in the matter. He said that the Constitution prohibits government hostility toward religion.